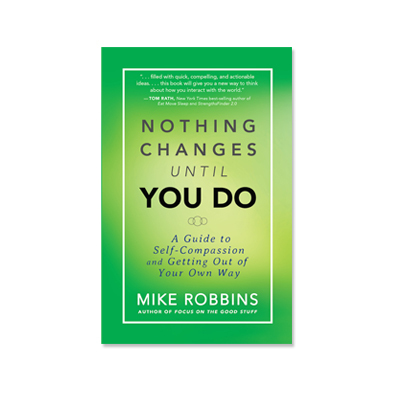 In the new book “Nothing Changes Until You Do” Mike Robbins explores the issues of self compassion and getting out of our own way. In my interview with Mike we discuss the important issue of self-love, and I don’t mean the narcissism. We all need to be asking ” Are the actions we take on a daily basis, self fulfilling or are we going through the motions?” Reflection and insight will awaken us to a new life, one with more intrinsic rewards. Mike’s book is filled with great stories that all of us can relate to about our life quests. Being gentle with ourselves and asking for help, can sometimes be a difficult thing to do, but reaching out and asking for support is sometimes all it takes to get us or of our negative mindset and move through some difficult times and challenges. I hope you enjoy this wonderful interview with a great authors. If you want to learn more about Mike and his other books please click here to be directed to his website.